We were recently in the Banner Elk / Linville area of North Carolina. There is what appears to be a castle that is a private residence with several outbuildings on the property. Some of the outbuildings appear to be very old. The road running in front of the castle is Tyne Castle Road. We were quite curious about it. Do you have any other information? 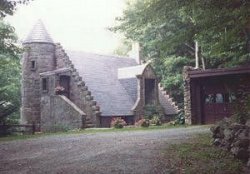 The castle in Linville was built by a Mr. Morton in the 70's as a private residence/private club of which my father in law was a member. There were plans for an even grander "castle" on a mountain above. Mr. Morton has died and the property is I think a housing development. Linville Chamber of C. will know all I am sure. Here is a link to an article regarding the history of your unknown castle. Thought this might be helpful. Thanks to Katrina Price for sending the link.